Making a DIY version of dishwasher pucks was something I stumbled upon completely by accident – like many good things, of course. Most homemade dishwashing detergent recipes, include citric acid for shine and non-cloudy glassware and which does its job well. The problem is, citric acid is hydrophilic – that is, it loves water, and thus when mixed in the recipe, it attracts moisture like crazy and if you don’t stir the mix every so often during the first 12-24 hours after making it, you’ll end up with a rock-solid lump in your storage container. And so it was that one time while making the homemade dishwasher detergent, I got distracted and forgot to stir in time and came back to a partially solidified mass in my mixing bowl. I picked out the hard lumps, set them aside, and a few hours later, realized the net result was a set of ugly, knobby, entirely functional dishwasher pucks. So the next time I made dishwasher detergent, I decided to try an experiment. I tweaked the recipe here and there, then tamped the mixture into mini-muffin tins, hoping to create little round pucks that would fit easily in the detergent compartment. No go, however, as the mixture solidified so hard that I couldn’t even scrape them out, let alone pop them out. And that was when I decided to try silicone ice cube molds, like these inexpensive ones from Ikea. Sure enough, once the fizzing had subsided and they were fully solid, these babies popped right out and were easy to place in whatever dry, air-tight storage container I wanted (such as the old flip-top container from a store-bought brand of dishwasher pucks or a mason jar). The only downside to making these homemade dishwasher pucks is that they do need a bit of babysitting as they cure. I tend to make them while I’m in the kitchen working on other projects, such as doing the dishes after dinner or during Saturday cleaning. But that aside, I’ve had such great success with these homemade dishwasher pucks that I’ve included them in my little homemaking journal e-book, Clean, Naturally! Since it’s that deep-cleaning, freshen-up time of year, I’m celebrating by knocking the price of that little book to $2.99 for the month of April. Just use coupon code SPRINGCLEAN2014 on the checkout page. 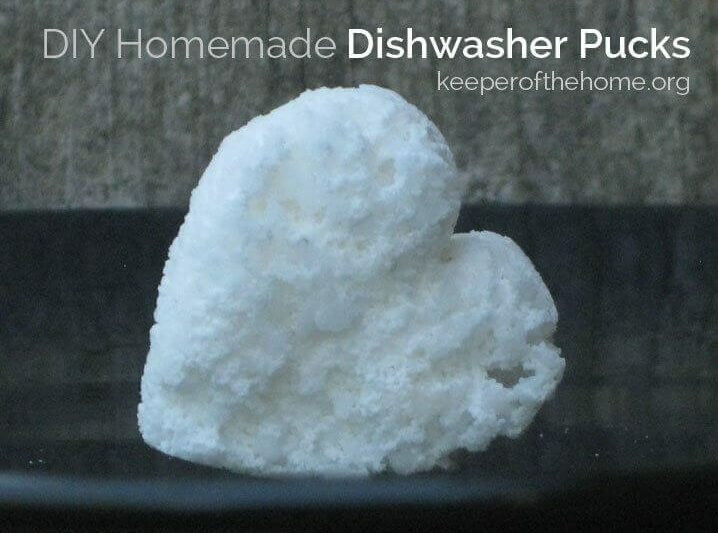 With that, let’s make DIY homemade detergent pucks! The citric acid is the magic ingredient for getting these to harden, but as I mentioned above, they take a bit of babysitting to harden as pucks rather than puffy balls. As the citric acid absorbs moisture, it fizzes and creates air bubbles, so you’ll need to tamp them down every few minutes over the course of an hour or so. Stir all ingredients together well, then let sit for about an hour until the mixture starts to bubble. Have 2-3 silicone ice cube trays or other flexible molds at the ready. When you notice the mixture beginning to bubble, stir well, then spoon it evenly into the molds and pack the mixture down well. Every few minutes, dampen your hands and tamp each puck down again firmly. After about an hour, the pucks will stop fizzing and seize into very hard pucks. Pop them out and break off any hard edges or lines that will prevent them from fitting in the detergent container in your dishwasher. Store in a dry, tightly sealed container. Use 1 puck per load. Wondering if water is mixed in, if yes then how much, or if the dry ingredients bubble on their own? Jeannie – A second thought… I realized I didn’t ask what kind of climate you live in, as it does occur to me that if you live in an EXTREMELY dry climate, these may fizz less. If you find they’re not fizzing, you might use a spray bottle and spritz the mixture ONCE until you see how it reacts. Again, that would only be in a very dry climate and a very small amount. I’m wondering if Lemi Shine works as the citric acid part of the ingredients? It also hardens when I use it to make dishwasher detergent, and the only ingredient in it is citric acid. Thanks for the recipe! According to LemiShine’s Material and Safety Data Sheet, the powder is only 5-10% citric acid, so it might fizz but not harden, but that’s truly just a guess. Try it and let us know! Do these really work well Kresha? I pretty much gave up trying a long time ago. Thanks!